Posters, retractable banners, sandwich board signs, wall clings, and floor graphics – Creative Communications offers highest quality and fast turnaround times for all large format products. You can submit your order via email to posters@u.washington.edu, and if your print ready file is too large to go through email, you can always place your printing/copying order online and web file transfer the files that way. We can print posters up to 60” wide and as long as you want. With mounting and laminating options and proofing and delivery service, we make getting your poster printed easy. Wide Format Pricing starts at $11.30 per linear foot, the cost of the paper is then applied. 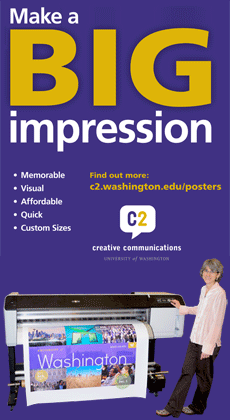 Please contact your account manager or posters@uw.edu for a quote! $275 includes the hardware and the posters installed.